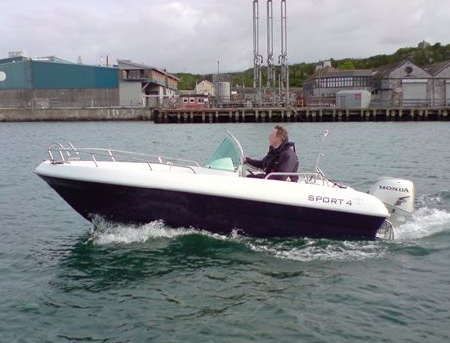 The Westport Sport4 is an open type general sports boat ideal for family and friends whether you are out water skiing, angling or just exploring the coast and estuaries. The finish and standard of equipment is excellent, from the stainless steel handrails giving a feeling of security and safety to the cushions giving comfort and style, she even comes with navigation lights. 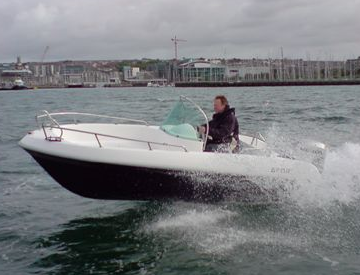 Performance is exhilarating and the console screen provides plenty of protection from the elements – a great all round boat. This design and style is based on the scandinavian layout, with handrails all around, but open at the forward end making boarding when beached or moored bow on easy and convenient. Inboard freeboard is good and the handrails help to keep younger and the older less sure footed secure. The hull is a conventional medium V planning form with plenty of flare above the topside nuckle, perfect for choppy waters and keeping spray down. The deck moulding incorporates seating for up to four, forward of the console, with room for up to three across the aft bench seat. This layout is variable and cushions come as standard. The steering console provides plenty of protection form the elements behind the screen with integral wrap around handrails. The navigation light switch is mounted to starboard and fitted, along with forward port/starboard and aft mast head lights, as standard. Room is provided for instrumentations and marine navigation equipment with the overall style being ergonomic and attractive. A moulded swim platform is incorporated aft, with ladder, lockers and ski-post, perfect for the waterbabies in the family. Lockers are also provided under the forward and aft seating, lockable with padlocks. 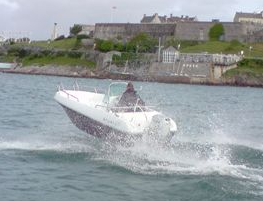 Performance, (approximate with single crew) 50hp - 29 knots max. 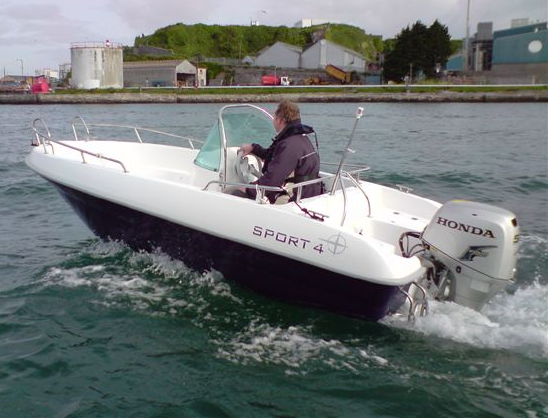 The January 2014 Sport4 standard boat only price is £7,995 but please contact us for the best boat, engine & trailer package prices. Price includes vat and is ex. works, Plymouth. The Sport4 is only built to order so please allow an 8-10 week build period when ordering. Every effort is made to ensure that pricing is correct, though we reserve the right to change pricing due to variations in supply.